Our new season starts in September and the programme for the remainder of the year is on the 'Current Programme Page'. In our practical evenings we intend to continue our programme of learning on all aspects of film making whilst still giving members an opportunity to see their films on the big screen. After many years of service to the Club both Roy Rippin and Mike Palmer retired as committee members at the recent AGM. Roy, who has been Vice Chairman for as long as anybody can remember, has been a member since 1960 when the club was founded under the name of "Market Harborough Cine Society". Mike has been a member since 1985, was treasurer for 10 years and has edited our newsletter since 2001. They will both remain as members but their hard work and enthusiasm for the Club over many years will be remembered for along time to come. 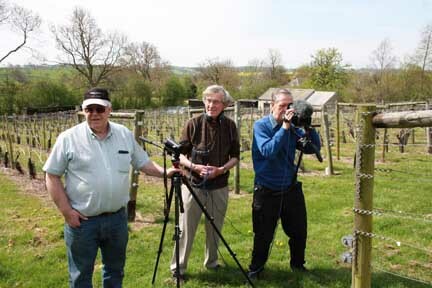 Our filming in the local vineyard has progressed well throughout the summer months. We started in early spring with the pruning of the vines, followed this with the flowers and then the small developing grapes. Later we have filmed the harvesting and the crushing process. Still more to come but you will have to wait and see the final film which will be premiered at our Theatre show next June. Peter on top of the world (Market Harborough's world) whilst filming the bell being installed into the Old Grammar School as part of its renovation. That's where we were, right at the top of the building. Now finished, doesn't it look great. Our film of the restoration process was premiered at the 2015 Theatre Show to much public acclaim.